Let's face it. Most of us are clueless when it comes to praying. Why is that? And how come we've never done anything about it? 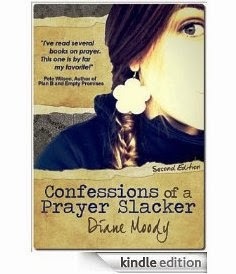 In Confessions of a Prayer Slacker, author Diane Moody traces her own personal prayer journey with a touch of humor and a healthy dose of transparency. "We're all slacking to do certain things. This book gave me a great perspective on prayer. "Confessions of a Prayer Slacker" is filled with great stories of the life change a relationship with God can bring you. She has a way with humor while confirming that God is always available to hear from you. God is not keeping a track record of your wrongs. He wants to spend time with you. After reading this book I wanted to spend more time with Him."